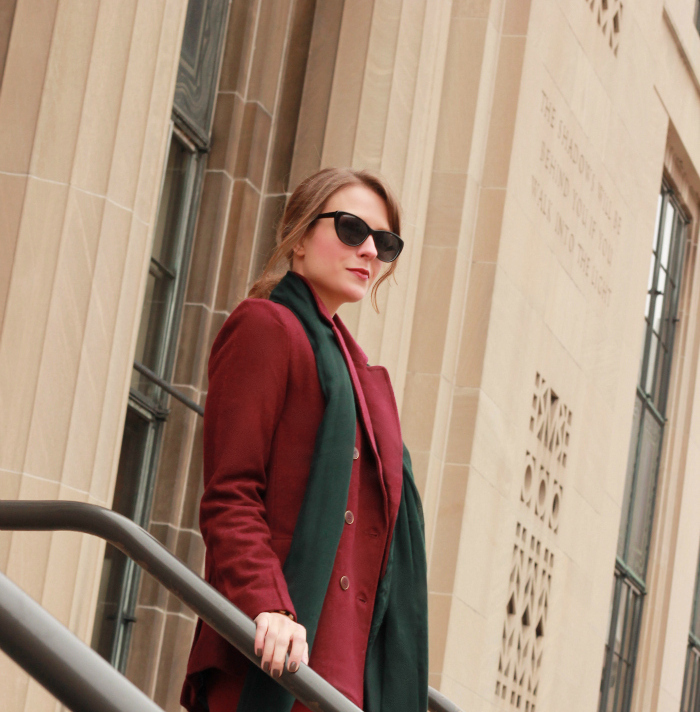 I have been wanting to put together a monochromatic outfit for a while now – so when I found this wool jacket, I knew it would perfectly match these cropped pants I bought at the beginning of the season. And since I didn’t have a burgundy sweater or top, I decided to break up the rich hue with black, hunter green & a dash of metallics. Speaking of, how amazing is this art deco necklace? It’s definitely a splurge, but well worth the investment if you’re looking for a unique statement piece. Chloe + Isabel also have some gorgeous affordable styles right now that I love (like this stone bracelet, this layering necklace & these sparkling studs) – all under $50! LOVE this monochromatic outfit! and that necklace is TO DIE FOR! gorgeous!!! Love that necklace! You look stunning!! Love it and Ive been looking for some good metallic pumps. Love these! I'm totally feeling this hue for fall. You look great! I'm totally feeling this color for fall. You look great Kimberly! Great look…really loving the necklace! 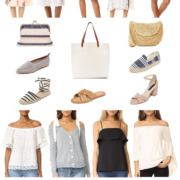 I have been watching your blog for a while now, and love how you can put lux and mid range items together with such success, I myself like to combine H & M with classic pieces. Like your style! Lovely outfit! That necklace is, indeed, amazing. I'm all about the Art Deco trend, but I've been unsure about how to pull it off with such a statement piece. I have to say, you nailed it! I love this! The silver shoes are so perfect. I am obsessed with that necklace!! It looks lovely the way you styled it! LOVE this color… no matter what it's called! Those shoes… wow! Those shoes! I have that bag on my wish list, SO love it! And the monogrammatic look is nice with the pop of black/green. The metallic pumps look great with this suit! Bonus point for pointy-toe shoes! Darling outfit! Love that necklace! I love that coat, the color is great! Love this look–Business chic! And that bag is to die for. xo. I love this monochromatic look – fabulous! love this monochromatic look! so fab. This look looks great on you. This color is always so flattering on you. Love that color combo. You look amazing, and that bag is perfect! The necklace is gorgeous, and I can't believe the jacket is Forever21! I am loving that bag! Glad you were able to find the coat for your monochromatic, those are some of my fav looks! Love the bag and the monochromatic look! I think these are some of my fav. kinds of looks because they are simple yet still chic! I love it! You look fabulous in this! I love the scarf and heels. You look so put together and classic. Where did you wear this? DYING over that necklace!! It's so stunning and perfect and I sort of need it in my life 🙂 Loving this monochromatic outfit. The blazer is a great find! The necklace really pops against the rest of the outfit. Great look! I like your sunglasses, very stylish! Kimberly, What a great polished look and I'm totally in love with this necklace. Just gorgeous! This outfit is amazing! The colors scream fall and holidays and sophistication. It's also lovely to see it's still okay to wear cropped pants in the fall. I just bought a pair and was deciding whether or not to keep them since I wasn't sure if I could wear them now that it's chilly. Cute! It's almost like a suit, but less stuffy. The mono look is SO chic, and pairing it with the hunter green kicks it up another notch. Such a gorgeous look! Such a gorgeous outfit, loving the silver accents! This is SO going on my blog today as a favorite look today. LOVE the monochrome! I love Monochromatic looks! and i like the burgundy with the forest green scarf! This color is so gorgeous on you. My favorite color this season. You always look so amazing. I completely love the entire look. Head to toe, you are always so stylish and chic. I absolutely love it. love, love this — especially stunning necklace (want to lend it to your sweet blogger friend!? ha) — and of course, this gorgeous photography. Beautiful on all levels. I'm loving this look! 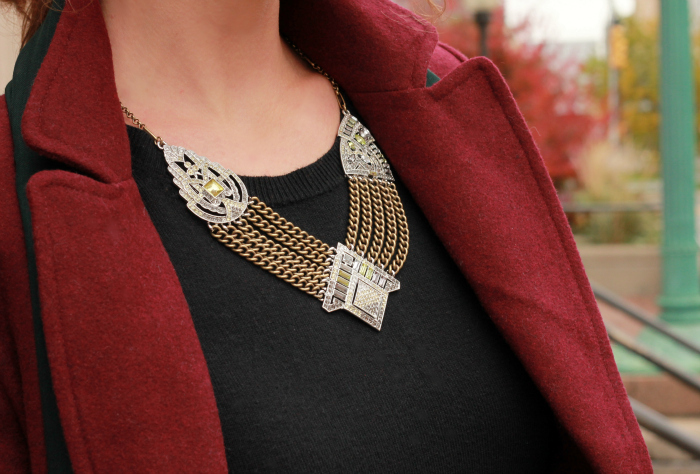 Love the colors, the jacket, and that necklace – it's amazing! Love your necklace and cropped pants! I'm loving this look! Your necklace is GORGEOUS! You look absolutely gorgeous! This color is very beautiful and the suit is so elegant. And the pop of metallic is so refreshing. Love-love! 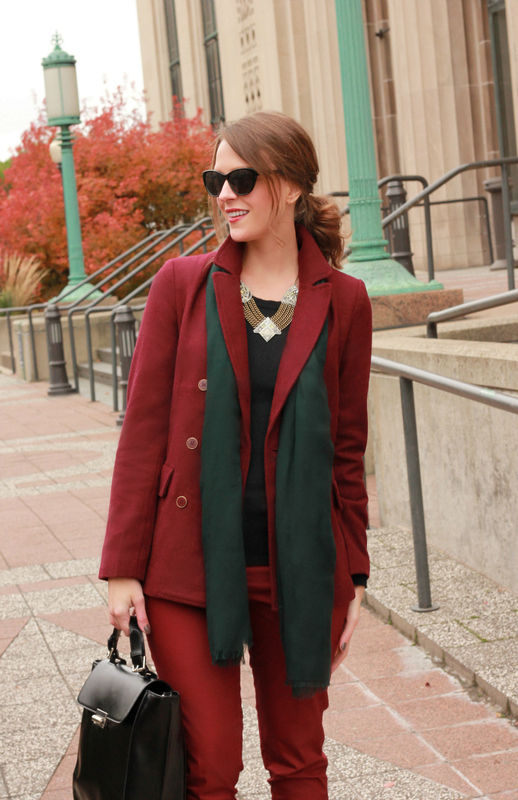 I love the red and green combo, it breaks up the monochromatic look nicely. This is a lovely blogpost. I adore all these inspirational pictures – I love how the necklace pops against your black sweater. You have a unique sense of style and you always make your outfits work so beautifully. I'm in love with your blog! i love this look! 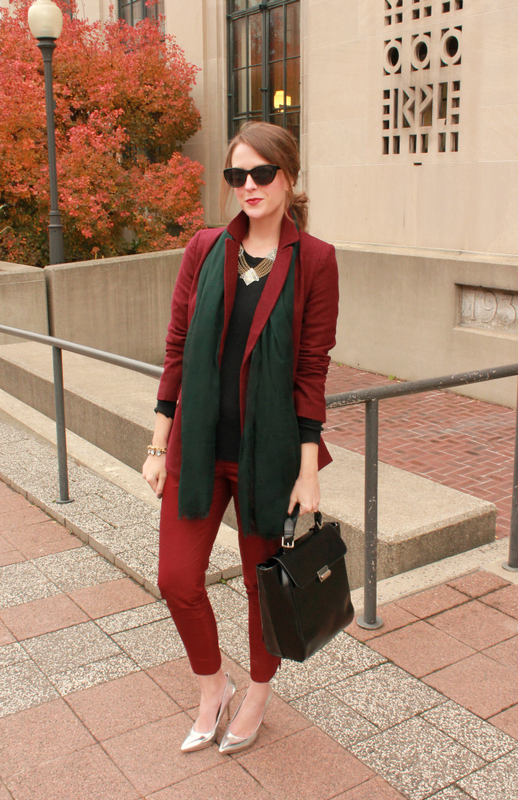 it's great how you put together the blazer and pants from different shops! love the burgundy look! soo cute! that necklace is divine! you look amazing in this color!! i especially love the shoes though!! This outfit is just all kinds of amazing-ness! LOVE the bold color choices. Ooh, love love and love! The blazer is fabulous. I love that deep color — crimson/burgundy is a favorite of mine.